"Pontoppidan Lutheran Church, Ellendale, Minnesota"
Congregation outside of Pontoppidan Lutheran Church. 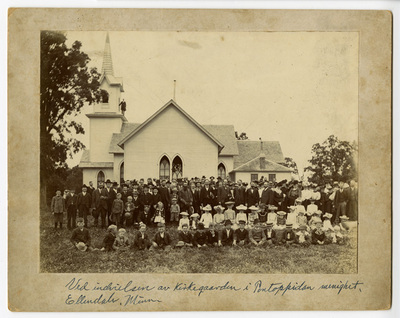 Handwritten on front of photograph, "Ved indvielsen av Kirkegaarden i Pontoppidan menighet, Ellendale, Minn.". Written on back "Pontoppidan Lutheran Church Ellendale, Minn. 5 1/2 mi. N., 4 1/2 mi. W."